MineMatch® records the kind of match recognised between each matching pair of target and deposit model attributes. This assists the reader of the report to understand MineMatch®’s reasoning, and it allows MineMatch® to adjust its similarity scores according to the strength or weakness of the match. MineMatch® looks at combinations of attributes (e.g. Element Enhanced to Ore) and values (e.g. Au, Cu) to match against expected combinations in the deposit model. For example, a Porphyry Cu deposit is expected to have Element Enhanced to Ore – Cu, so when a target has anomalously high Cu, it will match against that model. When viewing the interactive maps and the comparison reports, it's important to recognize that the map displays both a score and a number of matching attributes. Each time an attribute is matched, it gets a score that depends on the frequency it was expected to have in the model. The example report above is for Volcanic-Hosted Cu-As-Sb, and in that model arsenic (As) is always present at enhanced levels. 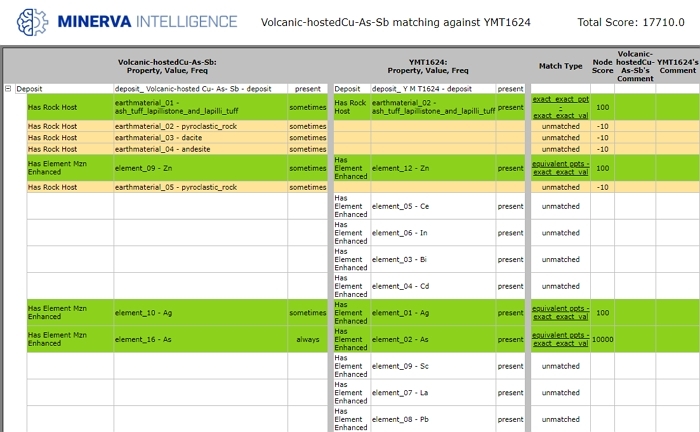 The target YMT1624 has enhanced As, Ag, Zn, and a variety of other elements, however Ag and Zn are only listed as "sometimes" present in the model, so MineMatch® awards different scores even though the attributes are matched. This is how it's possible for the target map to list a target with more matching attributes lower in the percentile ranking than another target with fewer attributes. The percentile ranking is based on the summed score, so fewer, more important attribute matches are higher scoring than many less important matches. Below is an explanation of each of the match types possible. MineMatch® uses taxonomies and can correctly match attributes that wouldn't match in a text search. An example would be a model looking for "igneous rock" and a target with "basalt". MineMatch® knows that basalt is a type of igneous rock. The "exact, exact" (bright green) match arises when the attribute-value pair of the target is exactly the same as the attribute-value pair of the deposit model that it’s being compared against. For example in the case of the screenshot above, "ElementEnhanced - Sb“ is something that the model is looking for, and "ElementEnhanced - Sb" is present in the target. A "possible, exact" (light green) match arises when the attributes only possibly match each other, and their values match exactly (as do Au and Au). 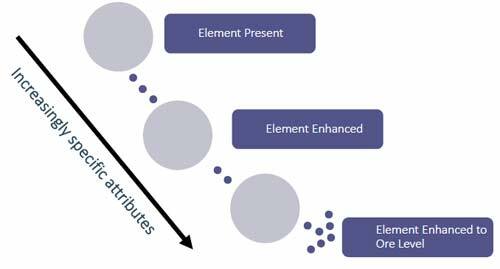 The “possible” term relates the fact that an "element enhanced to ore" level is a more specific subtype of “element enhanced.” Essentially the system is saying to the user: “this element is enhanced, it could be enhanced to ore levels, but I don’t know for sure.” The diagram below illustrates the hierarchical relationship between these concepts. The Exact, AKO (bright green) match arises when the model is looking for something, e.g. a granitoid host rock, and the host rock you have in the target is a kind of granitoid. 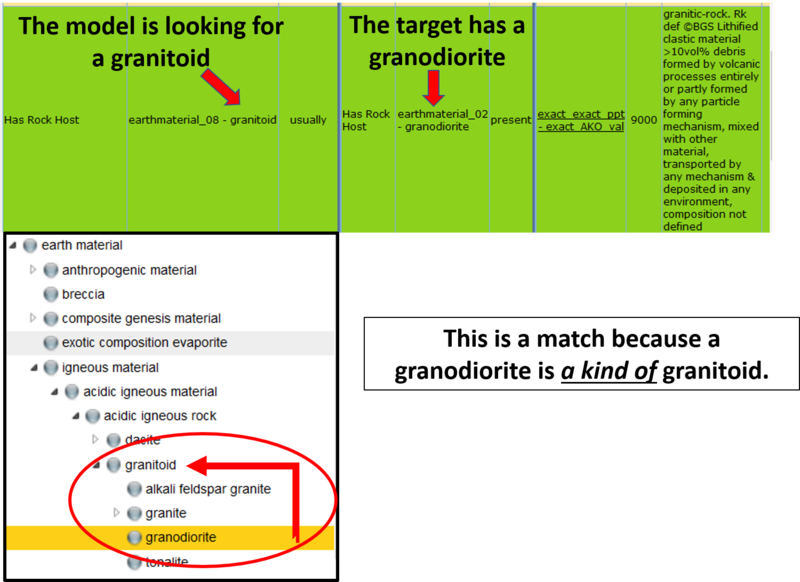 In the example case below, the target had a granodiorite as the host rock. In the taxonomy of rocks, a granitoid is a more general term, with granodiorite as a more specific subtype of granitoid. More simply you can say that "granodiorite is a kind of granitoid" in the same way you can say that "apple is a kind of fruit". If the model is looking for something general and you have a more specific version of that attribute, then it is an exact, AKO match. "Possible, Possible" (light green) matches arise when the compared attributes only possibly match each other, and their values may also only possibly match.